You’ve seen the video. A 15 story hotel is built in 48 hours. If you haven’t rest assured – 5.7 million people have. And it’s just above. Using prefabricated building materials is not new. But the complex assembly of a 15 story building in two days using prefabricated materials is new. From there it was on to a 30 story office building made in 15 days. Join the 4.8 million others who watched this time lapse video. It is this “attention to detial” that has many worried about the quick-build skyscrapers engineered by Broad Group. In an in-depth article in today’s The Financial Times journalist Simon Rabinovitch probes plans to build an even taller pre-fab skyscraper (Article available to online subscribers: Lofty plan builds on pioneering technique). A really, really tall pre-fab skyscraper. 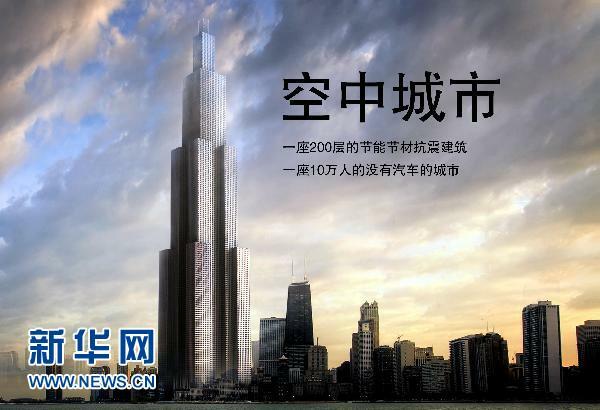 Broad Group are today seeking planning permission to construct Sky City in Changsha, Hunan Province. This 838 metre (2,750 foot) tower would be the world’s tallest, surpassing the Burj Khalifa in Dubai (standing today at 828 metres or 2,717 feet). What stuns many is not the size or scale of the development. It is the proposed construction time. The Burj Khalifa in Dubai took six years to construct – the same amount of time to build the World Trade Center in New York. Broad Group plans to build Sky City in three months. That’s 90 days or two to three stories a day. On the upside the Company is bringing pioneering advances in prefabricated construction techniques. Each module is completed off-site then plugged into place on-site. Modules are already wired, plumbed, gyprocked. Some compare the towers to enormous LEGO sets. Critics question the safety of buildings made largely to beat world records – tallest, fastest. Fast building in China isn’t always associated with awards. Just last week an approach ramp to a bridge in Harbin collapsed killing three. That three year construction project took 18 months and was opened less than a year ago. To balance out the supporters and critics, it is important to look at Broad Group as a harbinger of things to come from China. Critics decry China’s lack of true innovation. Manufacturers can make it faster or cheaper. What Broad Group has done is a real innovation, showing the global construction industry how the building process can be redefined. It is up to the engineers and safety officials to carefully review the plans for Sky City. If it can be built faster and taller and cheaper then why not? Just don’t invite me to the grand opening.